With a population of over 1.3 billion, chinese market under the automotive point of view plays a very important role. Most of the automotive factories are focused on this market that lately it's becoming very important for selling expensive toys such as supercars and hypercars. 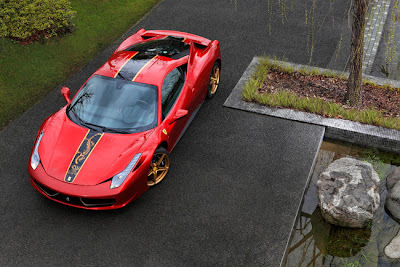 Ferrari wanted to celebrate the 20th year of introduction of their brand in China with the creation of a special edition Ferrari 458 Italia limited to just 20 units. 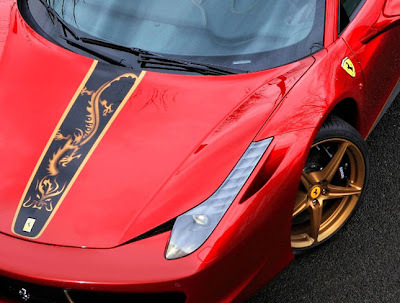 The special edition is finished with a new red paintjob called " Rosso Marco Polo ", the wheels are painted gold and over the car we find a fantastic black stripe with a gold dragon on the hood. Even the interior is special. 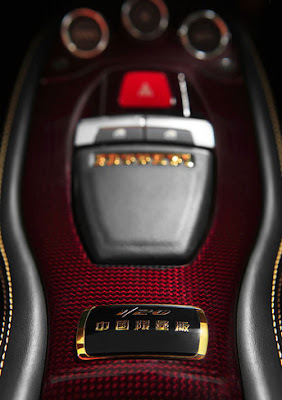 The Engine Start button on the steering wheel comes with chinese ideograms, on the central tunnel there's a plate that sais " 20th Anniversary Special Edition".